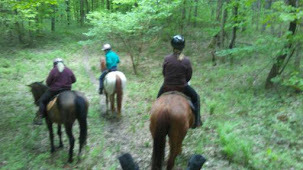 When riding with others there is a HUGE RULE that you really need to follow: and that is: BE CAREFUL WHO YOU RIDE WITH. Don't ride with idiots. Remember, what one horse does, the rest are very apt to do the same thing. 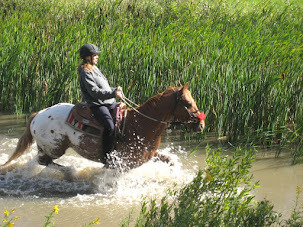 Here are some general trail riding tips - they seem quite obvious but, alas, they are often not followed. 2. Keep group together - some horses get panicky when the herd starts to separate. 3. Not all riders have good skills in handling their horse - be aware of this. Simply taking off is really rude and dangerous - it makes other horses nervous and some riders aren't good at controlling their horse - it makes for an accident waiting to happen. 5. 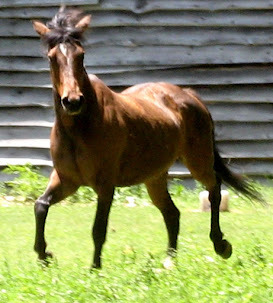 Not all horses are well desensitized - not used to soda cans popping, zippers and velcro, camera clicks/flashes, jackets & raincoats going on or off, ringing or vibrating cell phones, etc - they can get really spooked. 6. If crossing a road, keep your group together and make sure everyone gets across before going on. 7. Don't pass other horses - many horses may also take off. 8. 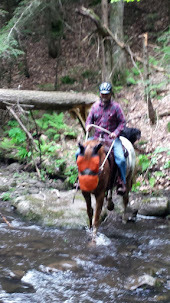 If at the creek, wait for the other horses to drink also - if you leave the creek, the other horses will follow instead of drinking. 9. Texting and phone calling - really really really rude plus your attention is distracted from your horse. 10. Know that bicyclists can scare the daylights out of a horse. 11. 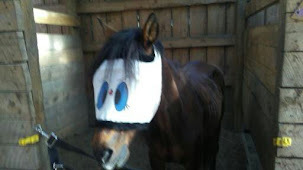 Clucking and kissing to your horse may be a green light to GO for other horses. 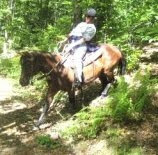 12, If there are two ways home - know that your horse might get scared of seeing other horses on a trail or some horses leaving or arriving on a different trail. too difficult for them to solve. 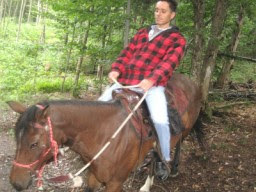 Thanks muchly for checking out my blog - and nice web page - signed up for your pdf - happy horse riding! a certified doctor. The target for the five hundred calories is high-protein foods.